Paxton’s statement noted that the cities of Deer Park and neighboring Galena Park ordered residents to stay indoors two separate times this week because of concerns about unhealthy air quality — and that those concerns also prompted Deer Park ISD and other area school districts to cancel classes for several days. An ITC spokesperson declined comment. The lawsuit came as crews worked to contain another fire that broke out at two storage tanks at ITC’s sprawling complex on Friday and sent up another black plume of smoke — and just hours after TCEQ had announced that a dike surrounding the fire-damaged storage tanks had been breached, sending crews scrambling to contain runoff. The first fire, which broke out Sunday morning and spread to more than a half dozen storage tanks, was extinguished on Wednesday. Throughout the fire, the agency said air quality monitoring indicated there was no threat to human health. That changed after the fire was extinguished, when monitoring indicated elevated levels of benzene. 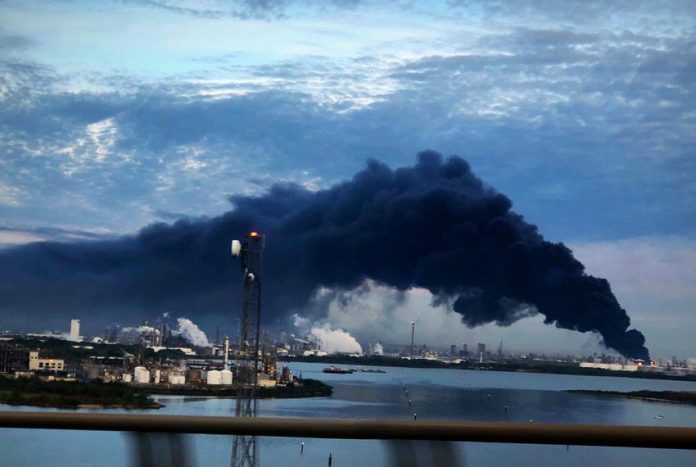 “Emergency crews working the extinguished fire site at Intercontinental Terminals Co. in Deer Park are addressing escaping vapors,” TCEQ said in a news release Thursday morning. Later in the day, the agency announced it was working with a variety of agencies — the city of Deer Park, Harris County, the U.S. Environmental Protection Agency and the U.S. Coast Guard — to assess water quality near the site. Environmental groups were quick to cheer the lawsuit. The statement noted that a recent report by the group found that TCEQ has penalized companies for fewer than 3 percent of unauthorized released of air pollution over the past seven years.